Today we began our “loop trip” through the south of Jordan, a five day jaunt that will bring us back to Amman on Thursday night, in preparation for our Friday morning flight home. Our first stop today was the town of Mukawir, the site of Herod’s “summer castle”. Approaching the castle is in itself a frightening experience, with an endless succession of switchbacks and turns in excess of 180 degrees that challenged our “wide body” motor coach at every twist in the road. 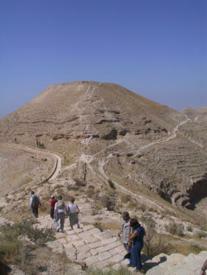 That part of the trip, however, paled in comparison to the twisting foot trail we needed to negotiate the gain the summit of the peak that housed Herod’s castle (pictured above). Given the height of the precipice and the forbidding terrain, it is hard to imagine how this fortress could possibly be defeated. Of course, that is the whole point of building edifices such as these in forbidding locations: defense and fortification are the very purposes for these sitings. Once we gained the summit, however, the view was breathtaking. We looked down on the Dead Sea, and across the Sea to southern Israel. Perched at a strategic bend in the King’s Highway, caravans and other travelers were plainly visible from the castle, and the requisite tribute was exacted from all who passed that way. Kind of like a very expensive toll booth. And there was no Easy Pass at the time. Huffing and puffing after the return trip down the mountain ( a 2,100 foot climb), we boarded the bus to travel south about sixty miles to Karak Castle, a Crusader fort constructed in the 11th Century to secure the eastern flank of the Christian Latin Kingdom. As with Herod’s castle, this impressive fort was built on one of the main north-south caravan routes, in order to keep a watchful eye on commerce in this area. In addition, however, another purpose of this castle was to prevent communication between the northern and southern Muslim armies that were a threat to Jerusalem. The story of this castle is one of greed on the part of Christians, however, which led to its demise at the hands of the Islamic force under the leadership of Saladin. A wonderful depiction of this story was released this summer as The Kingdom of Heaven, starring Orlando Bloom and Liam Neeson. It should be available in video stores this fall. While no substitute for visiting the area, the movie offers a good perspective on the times and the geography of the area. Leaving Karak Castle, we drive south through the night desert for about two hours, to arrive in Petra, the site of tomorrow’s explorations. On the way there we encounter a “rest stop” reminiscent of the New Jersey Turnpike, complete with fast food, cheap souvenirs, and crowded bathrooms. A little bit of home in an unexpected locale.